Might have potential however I’ve learned my lesson purchasing newly released themes and plugins. Does this support custom post / taxonomy based websites. I have over 30,000 posts in three different custom post types and multiple taxonomies. For a premium plugin I expect it to handle the above plus a few additional requirements. Specifically top post by day, week, month, year to showcase the results. I just guessing here but I suspect your premium plugin cannot handle that and unfortunately loses its appeal. It is great for rating but what is the point if we cannot showcase or display the results. Lastly, how can I get ahold of the actual install instructions. No professional will want the code auto inserted into their theme. Hi Grant, the plugin can most certainly handle the load and works with custom post types. It’s built using the native WordPress tables and caching mechanism so it’s fast too. It looks cool and the imo the widget / widget code is essential along with theme instructions. Looks good, can you add thumbs up / down to the ratings also? Then it would be a winner. @azzx, yes works with custom post types. Not sure what you mean by taxonomies though. You wouldn’t be rating categories. In Clipper, Stores are a custom Taxonomy, so with this plugin you can’t rate Stores. Is this correct? Taxonomies can be more than just Simple Categories. Your themes highlight this already. The thumbs rating is available as an option in other ratings plugins like GD star so you can use both with rich snippets. @azzx, that’s correct. We’ll have to get that feature added. Another Question: Does this work on custom post types and taxonomies? I wonder if it has to do with paging a list of top rated ads? eg rated and have 100 listings on the first page will show only the first 25 ads? Hi vitor, I’m not quite sure I understand your question. Are you planning to allow ratings on multiple criteria? I would like this be be added to the Vantage theme. Will this be possible? @Sarah, that’s a good suggestion. I think it would make more sense to request it in Vantage. Search our Ideas Exchange and if it doesn’t already exist, submit your idea! 1. Uuser revote with overwriting the previous vote. 2. Possibility to vote 0. 3. Support votes for only registered users. 5. Possibility of customize the rating images & text & rating method (0-10, 0-5, 0-100). 6. Possibility to show the user vote below the nick when he make a comment on a post/page/custom post type/etc. I know this is a lot of possibilities, if u can pick any ideas to implement :P, can you tell me what of this list is posible now with your plugin? 1. Yes, you can re-vote, thus changing your original vote. 3. 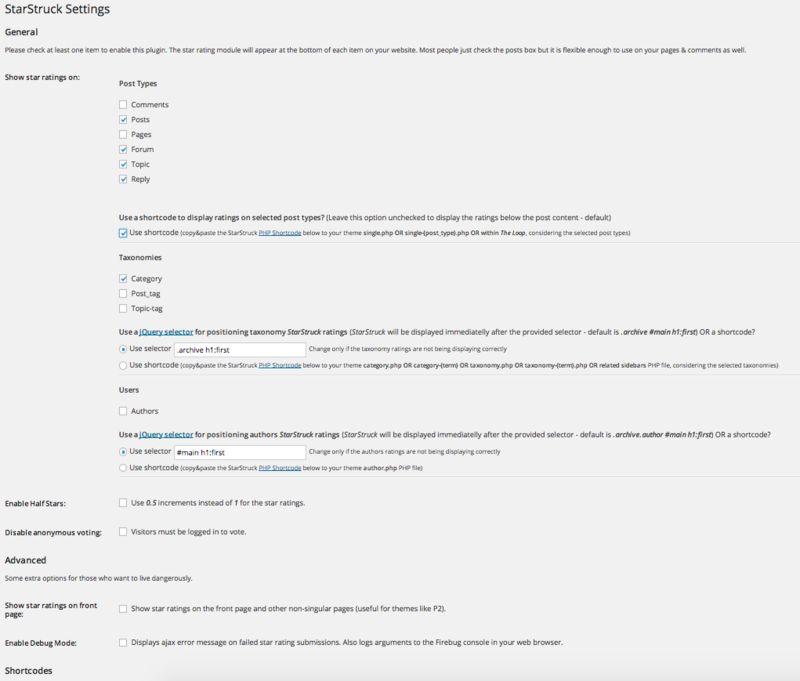 Yes, you can check a box in the plugin settings which requires voters to be logged in. 4. Star ratings can be shown on comments, posts and pages. 5. There are currently no built in settings to change these options. 7. Option not there currently for this. You would need to make customizations in order to add these additional options you are looking for. You may also like to add your plugin feature suggestions to the AppThemes Ideas Exchange where our team can consider these for future versions of the plugin. There is no guarantee that all ideas are implemented, but it will allow them to be voted for by our community to give some influence in consideration. Thanks. I have the Cachify Plugin on my Sites and a “htaccess” with extra Password for the Admin-Area and when a Visitor want to vote then comes the htpassword to edit it…look on my Site “spielen-gratis.info”! It was 19,-$ for nothing! Hi mell, I see what the problem is. Since you’ve got wp-admin password protected, we need to whitelist admin-ajax.php. Support is actually handled in our forums so I’ve started a thread for you. My answers are posted there. Thank you for your Quick Support…i found the treat…a have also make all changes…look pleas the treat! Would it be possible to use this plugin for rating Authors in ClassiPress in next plugin releases? Or maybe need to do it ourself? My friend bought this plugin for his project and I want to help him. So, should we wait or immediately start the modification? @dikiyforester, we’ve got plans to add this feature hopefully by the end of the year. We’ll be waiting release with this feature. Please clear me on this. Are all future themes and plugins available to Appthemes Club Developer? @junnydc, the AppThemes club package gives you access to all current and future themes (including AppThemes created child themes) released within the subscription period. You can read more about this on our pricing page. Thanks. this plugin seems to conflict with the ratings feature of vantage. I would like to view listings ratings and/or by popularity from the backend but it doesn’t seem implemented. wondering why that hasn’t been installed. @Harvey, just to clarify, are you referring to seeing the “votes” column in the wp-admin? yes. being able to see the reviews, number of reviews and the avg. rating (not sure what combination or display would be most effective) in an organized manner. is that something in the works? starstruck doesn’t seem ideal for that. thanks. @Harvey, sorry it’s not clear if you have already purchased the plugin or not, but if you have, please log into your AppThemes customer dashboard and download the latest version of the plugin available. If you continue to have problems then please post in the relevant section of the support forums here so that our team can assist further. Thanks. Would this be able to be used to vote on resumes or jobs in job roller? @Patrick, yes you can use the plugin with JobRoller and select the option to allow star ratings on job listings and resumes. Thanks. @Jan, yes there are plans for allowing rating of custom taxonomies in a future release of the plugin. I will find out if there is any information about when the release may be available and post back here to update. Thanks. @Jan, the next version of this plugin is planned for release by the end of February. Thanks. I am holding off on buying until we get multi rating in comments and ratings shown. I do not like gd star rating as it is too bulky and confusing and waiting for this one to get developed. Any ideas on muti rating will be done or developed ? Also i would pay premium price to get this done if need be. @matthew moore, I’ll check with our team about this and post back once I have more information. Thanks. yeah if it can function with multiratings, show in the post user votes average, and show in comment there vote . I would buy in a heart beat as the current solution gd stars rating system does the job but not on 3.0 without edits and too bulky. Thank you for looking into this. I know there will be a premium price and if you have a good rating system i would pay that price as i know others out there are looking for same solution. Can we also set so user can vote something like 3.4? 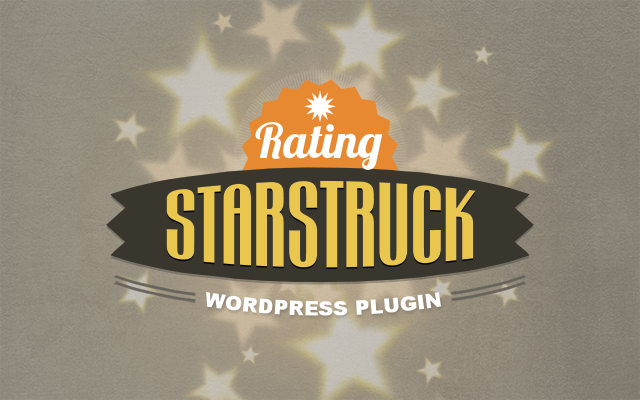 @drsnake, currently the plugin only allows full number/star ratings. Thanks. Any chance to get this working with bbPress replies? 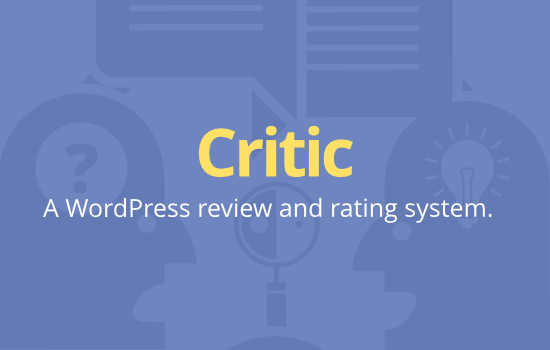 @Thomas, the plugin hasn’t specifically been tested with bbPress, but supports ratings on pages, posts and comments – so if bbPress replies are in the form of standard comments then it should function. Thanks. @matthew moore, Update: It’s something we would consider for a future release, but not for comments – just posts, pages, or custom post types. We will be selling a review plugin in the near future which will allow ratings similar to what you are asking for (you can see what that looks like by clicking on the “reviews” tab on any Marketplace item). Thanks. So the review plugin will have comment multi rating? Do you have a beta gounod in or release date? Also how do I register to see review rating in action. @Mmoore5553, the information mentioned above is about all I have at this point based on asking for feedback related to your specific questions. Since the reference point for how the new ratings plugin will work is what you see here in the “ratings” tab, I don’t believe it’s initially going to have multi-rating options, more that it will allow a rating with comment. The ratings on these pages are not for testing purposes, so they can only be used with verified customer accounts. I will try and confirm more details about a release date. Thanks. @Mmoore5553, to update – The new review plugin is estimated for release next month, although the multi-ratings feature would not be in the initial release and would likely come some months later. Thanks. oh that is great. I will have to hold off for months later as that is feature i need. If i can donate money to speed up development i am willing to do that. The plugin works with Clipper Stores (custom Taxonomy)? Require new users to confirm their email before account activation.